"Had to make a sandwich for a challenge in a group for another site; she gave us two mystery ingredients: red wine vinegar and red bell peppers. We then had to build a sandwich around those ingredients; this is what I made. Give it a try! It's so tasty, one person said it looked like a fancy bistro sandwich and it WON THE CHALLENGE for that week! If you don't have seedless jam, you can either use it with seeds or heat a little and put through a fine strainer. I left the seeds in and they are so tiny, it wasn't a problem. Your choice!" Whisk together red wine vinegar, raspberry jam, 1 tablespoon olive oil, and black pepper in a bowl until smooth. Cover bowl with plastic wrap and refrigerate to blend flavors, at least 30 minutes. Lightly toss tomato, spinach, and Italian cheese blend in a bowl. Drizzle the mixture with 3 tablespoons raspberry dressing and toss again. Heat 1 tablespoon olive oil in a large skillet over medium heat; place a tortilla into the skillet and cook until small brown spots dot the bottom of the tortilla, about 45 seconds. Flip tortilla over and cook until it starts to slightly puff up, another 45 seconds. Transfer the warmed tortilla to a plate lined with paper towels. Repeat with remaining tortillas; stack them on the paper plate with paper towels between each. Heat 2 tablespoons olive oil in skillet over medium-high heat; place chicken breasts into hot oil and pan-fry until lightly browned and no longer pink inside, about 5 minutes per side. Set chicken aside. In the same skillet over medium heat, cook and stir cremini mushrooms, red bell pepper, and green onion until mushrooms have softened and released their juice, 5 to 8 minutes. Transfer mushroom mixture to a plate lined with paper towels to remove excess moisture. Thinly slice chicken breasts, then chop into 1/2-inch pieces. Return chopped chicken to the hot skillet and cook and stir until the chicken is lightly browned, 3 to 5 minutes. 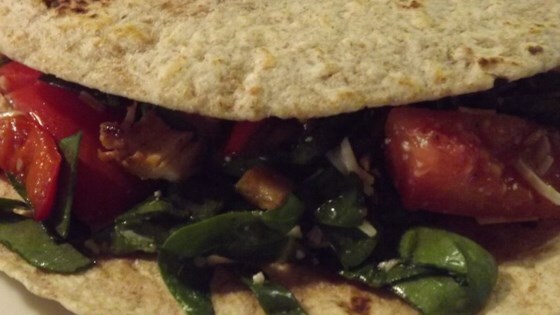 To assemble, place a warm tortilla onto a plate. Sprinkle with 1/4 of the chopped chicken. Drizzle chicken with 1 teaspoon of raspberry dressing. Top with 1/4 of the tomato-cheese mixture and 1/4 of the mushroom mixture. Roll the tortilla over the fillings to serve.